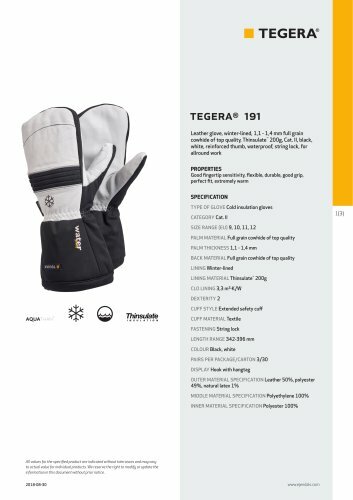 Thinsulate Leather glove, winter-lined, 1,1 - 1,4 mm full grain cowhide of top quality, Thinsulate™ 200g, Cat. II, black, white, reinforced thumb, waterproof, string lock, for allround work properties Good fingertip sensitivity, flexible, durable, good grip, perfect fit, extremely warm specification TYPE OF GLOVE Cold insulation gloves CATEGORY Cat. II SIZE RANGE (EU) 9, 10, 11, 12 PALM MATERIAL Full grain cowhide of top quality PALM THICKNESS 1,1 - 1,4 mm BACK MATERIAL Full grain cowhide of top quality LINING Winter-lined LINING MATERIAL Thinsulate™ 200g CLO LINING 3,3 m2-K/W DEXTERITY 2 CUFF STYLE Extended safety cuff CUFF MATERIAL Textile FASTENING String lock LENGTH RANGE 342-396 mm COLOUR Black, white PAIRS PER PACKAGE/CARTON 3/30 DISPLAY Hook with hangtag OUTER MATERIAL SPECIFICATION Leather 50%, polyester 49%, natural latex 1% MIDDLE MATERIAL SPECIFICATION Polyethylene 100% INNER MATERIAL SPECIFICATION Polyester 100% 1(3) All values for the specified product are indicated without tolerances and may vary to actual value for individual products. We reserve the right to modify or update the information in this document without prior notice.